Please refer to our stock # 3441 when inquiring. 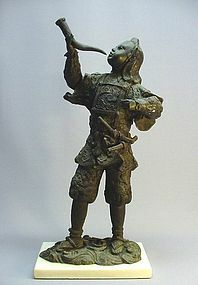 This very nicely cast metal young soldier standing on a white marble base is a late 19th or early 20th century product. It is 18 ¾” high, 8” wide and 5” thick (measure from the base). It depicts the young soldier holding an animal horn in his right hand and is wearing a pack on his back. It is in very good condition.